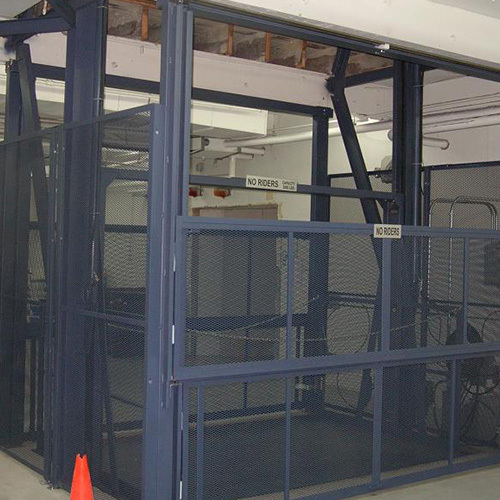 Our hydraulic lifts offer heavy-duty construction and advanced safety technology with proven reliability. 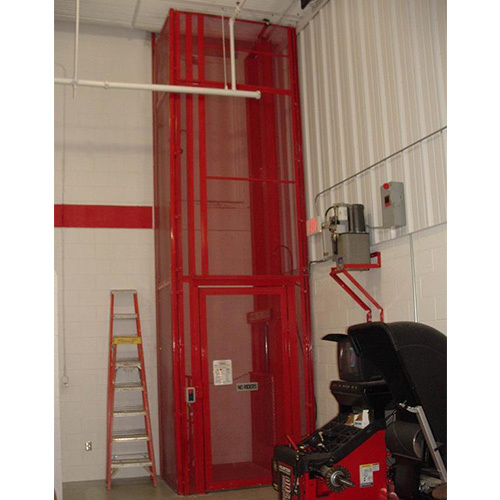 Our hydraulic lifts are available in straddle or cantilever design. Adaptable for mezzanines, through-floor, inside or outside applications. Lifts loads up to 6,000 lbs. Carriage sizes up to 12’x10’. Standard travel speed is 24 FPM (35 FPM available on special order). Carriage is lifted and lowered by two hydraulic cylinders mounted on 6” guide columns. Torsion bar links the two hydraulic cylinders to equalize the load and ensure the carriage remains level at all times regardless of load placement. Velocity fuses prevent uncontrolled descent in the event of hose rupture. Pressure switch prevents the carriage from drifting or sinking to ensure smoother, safer loading and unloading operations. Pressure-compensated control valve regulates flow of hydraulic oil to ensure smooth, constant lowering speed under any load. Quick-connect cabling for push-button stations and gate interlocks are optional. This significantly reduces field-wiring costs. Lifts loads up to 4,000 lbs. Carriage sizes up to 6’x6’. Standard travel speed is 17 FPM (25 FPM available on special order). Carriage is lifted and lowered by dual 2” direct-acting hydraulic cylinders mounted between 6” guide columns. Guided Dual-Pak design is direct action and has no cables, chains, bearings or other components that can break or require lubrication for a long-term performance. Velocity fuses prevent uncontrolled descent in the event of hose rupture. Pressure-compensated control valve regulates flow of hydraulic oil to ensure smooth, constant lowering speed under any load. Quick-connect cabling for push-button stations and gate interlocks are available, but not standard. This significantly reduces field-wiring costs. Ultra-highmolecular weight, polyethylene cylinder guide prevents cylinders from twisting during operation - improving cylinder life.